Recommended to: Readers who read and loved Dead Beautiful. Just when Renée has almost given up hope, she learns of the Nine Sisters--brilliant scholars who, according to legend, found a way to cheat death. She can't shake the feeling that they are somehow connected to her dreams, strange visions that hint at a discovery so powerful, and so dangerous, that some will stop at nothing to protect it. Renée thought she knew the truth about life and death. But there is a secret woven through history that holds the only hope for Dante and Renée. Unless they find answers soon, their time together is doomed to be cut short. After reading Dead Beautiful last year I was so excited to see where Yvonne Woon would take us next! The ending was a massive cliffhanger. 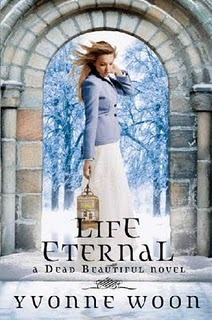 So when I had the chance to review a copy of Life Eternal, the second in the Dead Beautiful series, I hopped on it as soon as I could. One thing I loved about this particular book was how easily it picks up where the last one left off. We reconnect with Renée and see that life has become more difficult for her since Dante went on the run. She feels older, and less of a person. I liked seeing the changes in her since we parted ways. Unfortunately because of these changes, Renée is also extremely depressed for about the first third of the book. I didn't hate her for it. I understood it. Still, it made it tough for me to really get into the story. I wanted to shake her and tell her that life goes on, and things would work out if she just tried. What can I say? I'm an optimist. Essentially, the first third of the book is slow. But don't loose hope! Once Renée begins to come out of her slump things get really interesting. In this installment we are treated to a brand new school in France, new characters to help Renée along, and even a new mystery to solve. The Nine Sisters are a group of scholars that some believe figured out the key to eternal life. For Renée, that means a chance to finally be with Dante. What ensues is a manic romp through France and the areas beyond. Running through dark underground tunnels, visiting graveyards, following clues, Renée does it all in the quest for true love. I very much enjoyed the way that Yvonne Woon allows the reader to slowly uncover the mystery along with Renée. There is no way that you'll figure things out before she does. A trail of breadcrumbs is laid out beautifully, giving you little bits and pieces of what lies ahead. I honestly loved the addition of Noah to this book. Giving Renée something else to focus on, someone else to focus on, worked well with the story line. When you barely see the person who is the object of your adoration, how do you know if they are truly doing what they say they are? That is the question that fuels this book. Although Life Eternal started out a little slow, and Renée might have bugged me a bit, I honestly did ultimately enjoy this book in the end! The ending was maddening, coming to a peak with a cliffhanger that just about made me sob. Let's be honest though, it hooked me. I'm in for the long haul! Book number three, here I come. Take home a copy of Undertow by Callie Kingston! Win a copy of Trafficked by Kim Purcell!